So This Is How They Do It! 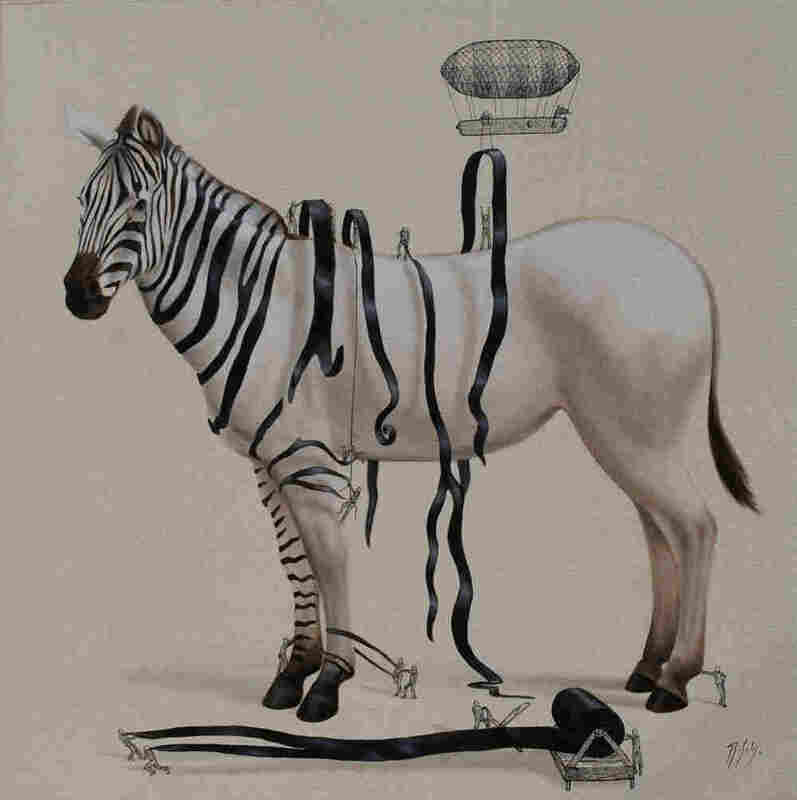 Zebras Getting Stripes : Krulwich Wonders... 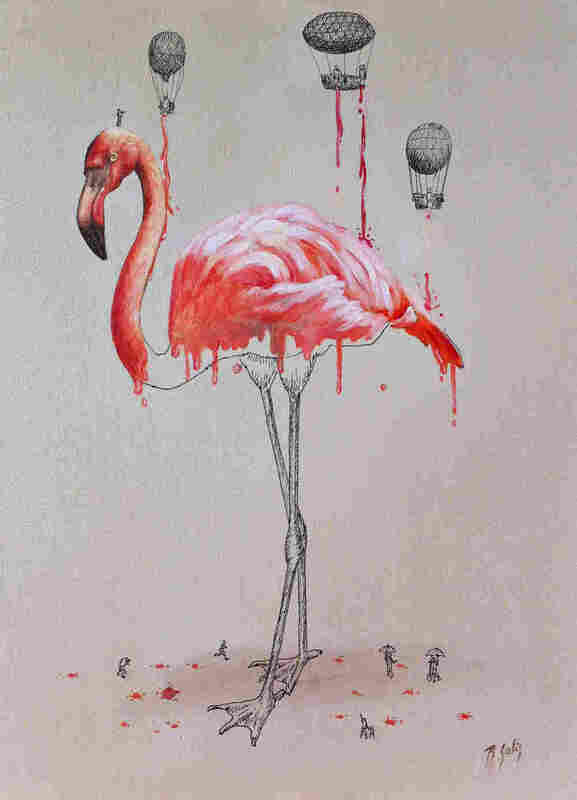 The pink on a flamingo? Stripes on a zebra? Spots on a giraffe? All explained. Simply. Elegantly. Oddly. How did it happen? How'd the zebra get its stripes? In Rudyard Kipling's version, a gray, horsey-looking beast went into "a great forest 'sclusively full of trees and bushes and stripy, speckly, patchy-batchy shadows," stayed there awhile, and after a "long time"... got stripy. Here's another notion, this one from Ricardo Solis, an artist working in Guadalajara, Mexico. He says a team of highly intelligent, "mini-me" creatures got itself a roll of black ribbon. Using giant scissors, the mini-me's cut themselves long slivers, which, dropped from a blimp, they pasted on a horse. This is such a satisfying explanation. No waiting eons and eons. No random mutations. No molecular biology. Just a team of itty-bitty designers doing, well ... almost intelligent design. They're not precise. Life should be accidental, which is why it feels right that a flamingo gets its pink from teeny buckets of paint, randomly poured. And why the mini-me's down below have to protect themselves with small umbrellas. Plus, creature-building should be hard work. In making a giraffe, a team of designers had to draw, manufacture and stock each golden-brown blotch, and ship them to the studio, where this monster-sized animal, tethered by a handful of mini-me's, is patiently waiting to be accessorized. It's a paint-by-numbers job, each blotch must be fitted to its pre-figured spot, and if they take too long and the giraffe gets restless? I'm not even going to think about that. In the Bible, genesis happens super-fast, as befits an all-powerful being. Creation is a six-day effort, from "let there be light" all the way through zebra-striping, giraffe pigmentation and flamingo pinks. Then, on the seventh day, God rests. He gives Himself a single day off. One. Not the mini-me creatures. Ricardo Solis doesn't say, being an artist, but I'm figuring those little guys needed two, three full days to paint in each giraffe. Multiply that by the number of giraffes on order, and creation is a labor-intensive nightmare. 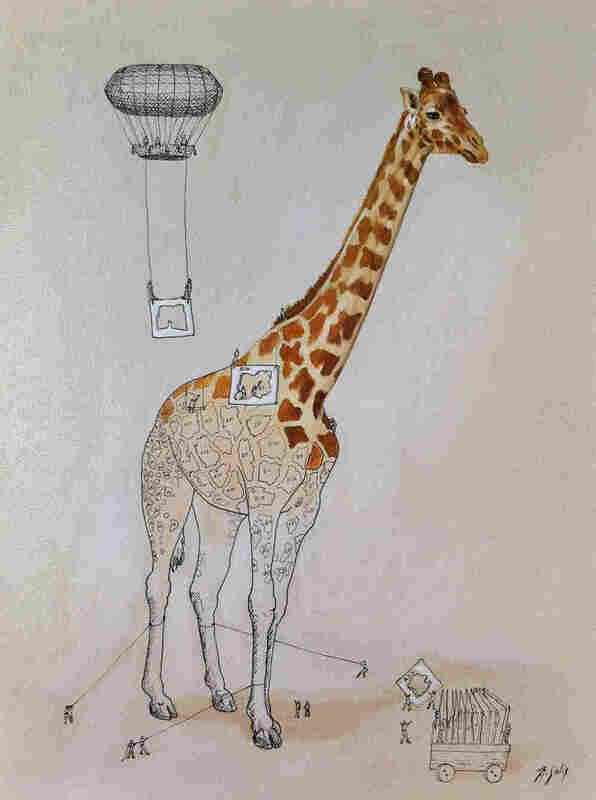 Figuring regular weekends, summer vacations, holidays and medical leave for paint-poisoning, giraffe gestation is going to be very, very slow — which is why, if Ricardo Solis ever visits Africa and gets to see 50, 60 giraffes ambling together across the plain, he — more than the rest of us — will blink, smile and say, "That? That is a miracle!" There are many routes to appreciating the bounty about us. To see more Ricardo Solis drawings – of hippos being inflated, armadillos getting armored — you can find his latest work collected here.